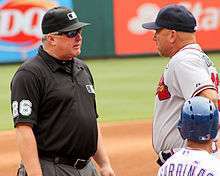 William Scott Miller (born May 31, 1967) is a Major League Baseball umpire who began his career in the American League in 1997. Miller wears number 26. He has been a crew chief since the 2014 season. Miller graduated from UCLA with a history degree in 1989. Miller umpired in the Northwest League, Arizona Instructional League, South Atlantic League, California League, Texas League, International League, and Pacific Coast League before reaching the MLB in 1997. While umpiring in the International League, Miller was robbed at gunpoint at a hotel. Miller has officiated in three Wild Card Games (2012, 2014, 2015), six Division Series (2002, 2003, 2005, 2008, 2010, 2013), five League Championship Series (2009, 2011, 2012, 2014, 2015), and two World Series (2010, 2013). He also officiated the 2007 All-Star Game and twice in the World Baseball Classic (2009, 2013). On May 15, 2012, Miller was involved in an altercation with Toronto Blue Jays third baseman Brett Lawrie during his last at bat. With a 3–1 count, pitcher Fernando Rodney threw two balls, based on replays and computerized strike zone analysis. Lawrie headed towards first after each pitch. However, Miller called the pitches strikes and ejected Lawrie after he protested the strikeout. Lawrie then threw his helmet, which bounced off the ground and hit Miller. The next day, Lawrie was suspended by Major League Baseball for four games. Miller was chosen as one of the umpires for the one-game Wild Card playoff between the Baltimore Orioles and the Texas Rangers on October 5, 2012. Before the 2014 season, he was named a crew chief by Major League Baseball. Miller graduated from University of California, Los Angeles in 1989, and resides in Incline Village, Nevada. He was a three-sport athlete at Harbor High School in Santa Cruz, California, and was named Athlete of the Year in Santa Cruz County for his senior year. He is an alumnus of the Sigma Chi fraternity. ↑ "Bill Miller". Retrosheet.org. Retrosheet. Retrieved 2011-09-03. 1 2 3 "Bill Miller – 26". MLB.com. Major League Baseball. Retrieved 2011-09-03. 1 2 "Video". MLB.com. Major League Baseball. Retrieved 2012-05-16. ↑ Lund, Chris (May 16, 2012). "Brett Lawrie, the ump and the human element". The Hardball Times. Retrieved 5 June 2012. 1 2 "Lawrie drops appeal of suspension". SI.com. Associated Press. May 17, 2012. Archived from the original on June 4, 2012. ↑ "Seven new umpires appointed". MLB.com. Retrieved April 7, 2014. ↑ "UEFL Profile of MLB Umpire Bill Miller". Close Call Sports and the Umpire Ejection Fantasy League. March 7, 2013.